My lovely friend brought me over a huge bag of cooking apples and it got me thinking about a recipe for an open apple pie that I made for my first book A Passion for Baking. I wanted to give it a Christmas twist and there on the side was a huge jar of my homemade mincemeat, screaming out to compliment the caramely apples. It went down very well here. Please do heat the tray as it really helps to avoid a soggy bottom! Put the flour, salt and butter into the bowl of the food processor with the metal blade and whizz until you have a breadcrumb consistency. Add the egg yolk, whizz then add the water a tablespoon at a time until the dough comes together. Turn onto a floured surface, work very briefly. Wrap in clingfilm and chill for at least half an hour. Preheat the oven to 210. Place a baking tray in the oven to heat up while you prepare the pie. Peel, core and dice the apples. In a large pan add the butter, sugar and apples and gently saute until the apples begin to soften. Use a slotted spoon to remove the apples and set a side to cool, add the cream to the pan, heat while stirring to make the Caramel apple sauce. Lightly dust the work surface with flour and roll out the pastry to a circle roughly 30cm in diameter and slide onto piece of baking parchment. Spread the mincemeat into the centre of the pastry, leaving a 7 cm boarder add the diced apples over the mincemeat. Fold the pastry border up and over the apples, brush with egg wash and sprinkle with demerara sugar. Any pieces of pastry that may of broken off crumble over the top. Slide the pie onto the hot baking tray turn the oven down to 180 and cook on the middle shelf of the oven for about 25-35 minutes until the apples are tender and the pastry is crisp. Serve with the caramel sauce and fresh cream or custard. 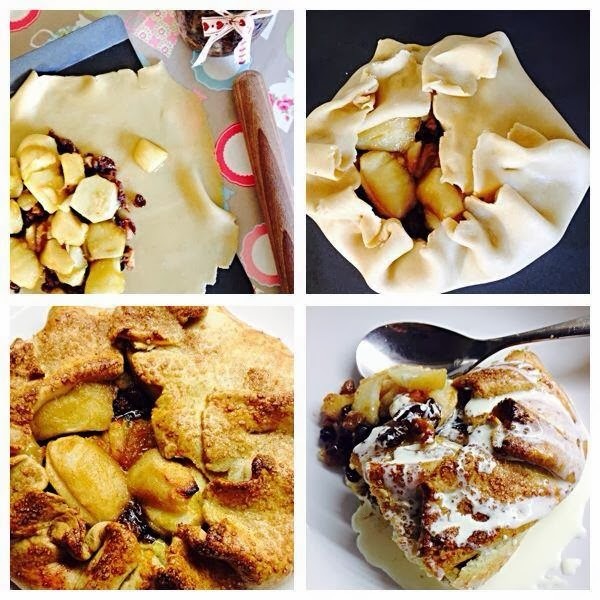 *Top Tip make the pie on parchment paper it will make it easy to pop onto the hot tray.